23 June 2017. 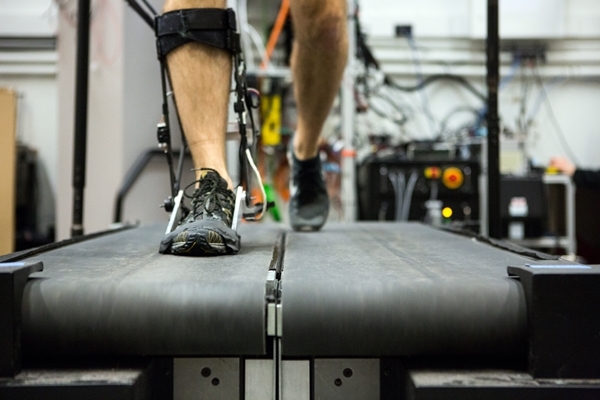 Researchers at Carnegie Mellon University in Pittsburgh wrote and tested an algorithm for exoskeletons that customize the devices to a person’s walking pattern in about an hour. A team from the lab of engineering professor Steven Collins describes its work in today’s issue of the journal Science (paid subscription required). Exoskeletons are lightweight frames with sensors and motors worn like braces over the legs that provide at least some walking ability to people who are paralyzed, fit over prosthetic devices to help amputees walk, or provide more mobility to individuals with limited ability to walk, such as people recovering from a stroke. The devices work by supporting a person’s weight and assisting the muscles to move the legs in a walking motion. The technology in exoskeletons improved over the years, becoming smaller, lighter, and more finely attuned to different muscles needing support, but they remain basically a one-size-fits-all device. Collins and colleagues sought a way of personalizing the devices to a person’s unique walking motion. The solution, however, would need to work quickly and make the necessary adjustments to the exoskeleton in near real time. The Carnegie Mellon team focused its solution on the actions of ankles and feet, using an exoskeleton developed to help with rehabilitation for individuals learning to walk with a prosthetic device on the lower leg, or in recovery after a stroke. The device has sensors implanted that measure the energy expended and torque, or rotational force, patterns when walking. The researchers use data from the sensors to note subtle differences in the walking patterns between the two ankles and feet, measuring peak torque and the timing of that rotational force on each ankle, as well as the rise and fall times of each foot. Their system collects data for about an hour from an individual testing the exoskeleton, then an algorithm adjusts the torque support provided on the exoskeleton to minimize the amount of energy expended by the user. The team tested the system with 11 healthy volunteers wearing the exoskeleton and walking on a treadmill. The system found wide variations in walking style, which required different adjustments in support provided by the exoskeleton, as well as underscoring the need for customization of these devices. With an optimized exoskeleton worn on one foot and ankle when walking, the researchers found the users expended on average about 24 percent less energy, compared to a similar exercise wearing the exoskeleton without the customized adjustments. Similar results were recorded when individual participants wore personalized exoskeletons on both ankles and when running. Other participants who wore the exoskeletons for extended periods found the systems continued to find adjustments for the devices, suggesting an individual’s walking patterns continue to change and that personalized exoskeletons may need further adjustments over time. The authors believe this approach to prosthetics could make possible faster and more personalized rehabilitation, taking more factors into account, such as endurance and balance. Prosthetic devices could also be adjusted over the course of a person’s rehabilitation as they move into their day-to-day lives. Likewise, devices could be monitored and adjusted over time as their circumstances change or conditions improve.